Bill Clarkson, is a 1993 Graduate of Leadership San Ramon Valley. He was elected as the Mayor of San Ramon in 2011. He was raised in Oakland and received a Masters in Business Administration at San Jose State University. He is married and has a married daughter. Bill is a small business owner, and began his company in San Ramon in 1979. His real estate firm, Golden Hills Brokers, is the longest continuous owned real estate brokerage firm in San Ramon. He was awarded the “Business Person of the Year” by the San Ramon Chamber of Commerce in 1997 and by the Contra Costa Business Council in 2002. Bill was elected to the San Ramon Valley Unified School District Board in 1998 and served three terms, including three times as the Board President. Bill also has a long history of service with the San Ramon Chamber of Commerce, serving on its Board of Directors for 11 years, including one as its Chairman of the Board in 2008. Bill is also a long-term San Ramon Rotarian and enjoys its opportunity for community and international service. In 2000 Bill traveled to Africa with a Rotary International team to administer Polio vaccinations. In 2010 he helped to found the Dougherty Valley/San Ramon Rotary Club, and served as their Charter President. 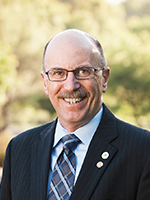 Bill has served in a number of positions with the City of San Ramon. He was a member of the Housing Advisory Committee, serving as its Chair in 1994. In 1998 he was a member of the City Charter Commission, and was a Parks and Community Services Commissioner from 2009 to 2011.